The Mural Department conservators are trained in the treatment of oil, fresco, acrylic, and other media. The Center is equipped to handle murals in various sizes that are created on plaster, canvas, metal, wood, and paper. Often up on scaffolding, working a square inch at a time, this department meets the demand of preserving large-scale public art. Pioneers and Indians, Datus E. Myers, 1920, oil on canvas, at Linné Elementary School with students. Outstanding American Women, Edward Millman, 1938-1940, fresco, Lucy Flower Career Academy High School. Construction Site, Gordon Stevenson, 1909, oil on canvas, Lane Technical High School. Heather Becker's Art for the People, published by Chronicle Books in 2004. The Mural Department conservators are trained in the treatment of oil, fresco, acrylic, and other media. Founded in 1996, the Mural Department’s portfolio now includes treatment of over 600 Works Progress Administration (WPA) and Progressive Era murals across the United States. The Chicago Public Schools (CPS) constitutes the largest remaining mural collection in the country. These murals were painted between 1904 and 1943. The Center has fostered a relationship with CPS and has assisted with the preservation of 440 murals across the city. In 2002, The Conservation Center co-curated an exhibition with the Art Institute of Chicago entitled To Inspire and Instruct: Murals from the Chicago Public Schools to re-introduce the restored murals to the public. Heather Becker, The Conservation Center's CEO, is widely considered to be an expert in the restoration of early-20th-century murals in Chicago. She authored a book on Chicago murals and art preservation entitled Art for the People (Chronicle Books) in 2004. Click here to read all press related to the CPS mural preservation project. 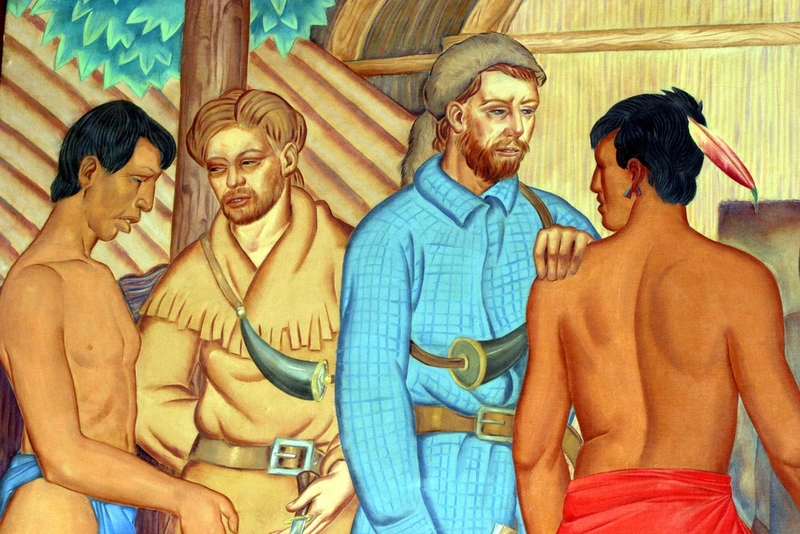 Indians and Fur Traders (detail), Tom Lea, 1907–2001. Calumet Park Field House, Chicago Park District. Had it not been for a leaking skylight, it might never have been discovered! Forgotten and almost entirely covered by plaster, paneling, and cabinets, the mural was found during construction efforts to fix a leaking skylight in the West Foundation’s garage. The plaster onto which the mural had been painted was so badly damaged that our conservators determined this project would need not only the work of our team, but also a plaster expert to fill in the walls, as well as an outside artist to recreate the missing parts of the mural. The Merchandise Mart, towering 25 stories at its highest point and occupying four million square feet, rests along the Chicago River as the epicenter of downtown Chicago life, culture, media, and business. Finished in 1930 and massive in its construction, The Mart serves as a monument to early 20th-century merchandising and architecture. Even after more than 80 years, this Art Deco landmark continues to be a leading retailing and wholesale destination, attracting people from all over the world.